Yes, you can sell anything! We’ve all been there. We’ve bought too many shoes or phone cases or jackets or jewellery or kids toys or goldfish tanks. Whatever it may be, Swapit is the right place to sell it. Our active community of buyers and sellers is as versatile as it can be. So let’s learn how you can sell your fish tank on Swapit. You can do this in less than 30 seconds. That’s it. 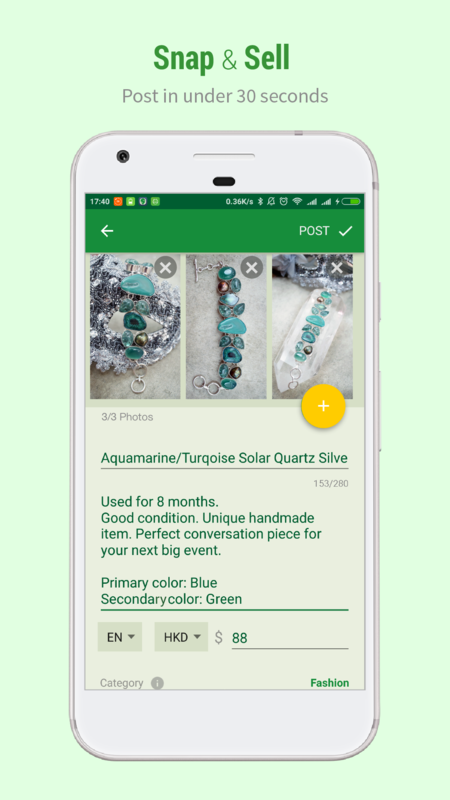 Now hit the “POST” button and your items gets published instantaneously. The beauty of Swapit’s hyperlocal marketplace is, that we find potential buyers for you, nearby. So as soon as you hit the POST button in step 1, our Swapit marketplace platforms goes on the hunt for buyers of your item. May it be some nice high heels, a bracelet or a fish tank, Swapit is looking for someone nearby who is interested in what you’re selling and it will contact the person right away. Only on Swapit it is possible to feature your own items. If you’re selling your one year old MacBook Pro because you’ve recently upgraded to the latest model, you could spend US$1 on featuring your listing on Swapit. This will significantly increase your listing’s exposure and therefore it boosts the chances to sell it quickly. If it’s the first time you’re featuring an item, please have a look at this blog post: Swapit Update: How To Feature Your First Item for Free. When buyers are interested, they usually reach out to you directly. Swapit has chat built-in, which provides a secure and safe place to have a private conversation. Rest assured, all information exchanged there is treated confidentially. Potential buyers might send you an offer of an item you’re selling. You can either accept or decline that offer. It is in your sole discretion to sell to that buyer or not. As a seller you do not have to speak the buyer’s language. 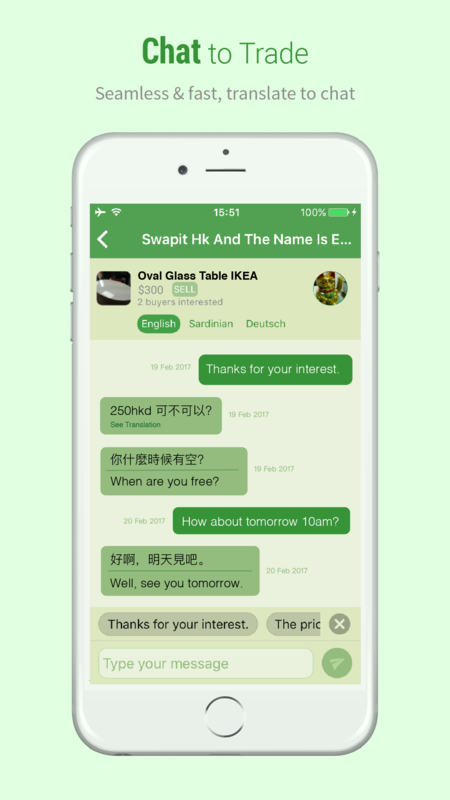 Swapit has built-in translation of chat messages, which allow buyers and sellers to communicate across different languages. While we use latest natural language processing and translation technology, our translations will not be perfect. However, they allow each party to get the gist of the conversation and to safely transact and close this sale. Swapit does not charge a fee or commission if you complete your transaction by cash. So if buyer and seller meet up to close a sale, it’s a free-of-charge service provided by Swapit to both parties. It’s as easy as cake! When you open up Swapit, you can either jump right into one of the categories or you can view only all free items or you can simply search for something you might be looking for. It’s quick and easy. Click the magnifying glass 🔍 and enter your search term, for example “iPhone 7”. Hit search and your results show up. Say you’re looking for “Fashion”. There is something we call quick select that you can choose to only view “Fashion” listings nearby. Hit that and you’ll get to see the best deals in your area. Swapit is a hyperlocal marketplace, which means you’ll always get to see relevant listings that are nearby. Hit the “Latest” quick select to get a list of all listings that were posted in your city. The most recent one is at the top. Swapit has been built to be intuitive. So using it feels natural and you’ll discover many new things while you’re browsing our huge catalog of listings. Should there be no listing in your vicinity yet, just list something from your home. You’ll be the first one in your area. So you get the prime spot! Getting the bargain you just found through browsing Swapit, is even easier. There are multiple ways to get them. Please have a look below. If you’ve found an item you’d like to buy, say some nice shoes 👠👟👞, simply open that item and verify that all information in there is to your satisfaction. Now hit the “Make an Offer” button and you can enter the price you are willing to pay for it. If you’re not sure about the price yet, but you’d still like to get the shoes, you can click “Chat to Buy” and start a private conversation with the seller. For example, if you need clarification on the quality or the condition of use. Rest assured, all conversations between buyers and sellers are confidential and you can safely talk about all issues concerning the products of your interest. Trade nearby with confidence and possibly your neighbors. Most buyers and sellers on Swapit actually meet up and do their trade in-person. That allows the buyer to inspect the item before paying the seller. Yet, we are working tirelessly to bring new ways of trading to you – in a safe and trusted environment. Swap on and stay tuned for more ways to trade.